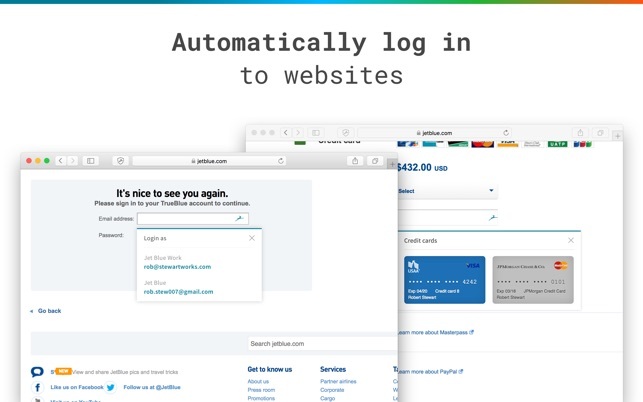 - Instantly autofill forms and payment info using the Dashlane browser extension. - NEW! Secure Document Storage: Encrypt and store sensitive documents and files in Dashlane to access them anywhere. 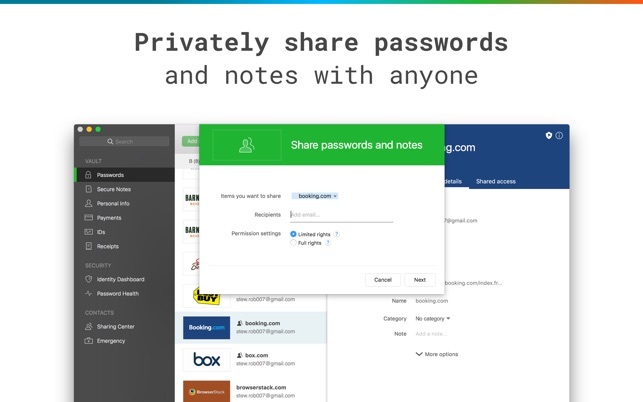 - Dashlane Free: Manage up to 50 passwords and autofill all your personal information on your Mac, free for life. -Our patented security architecture uses AES-256 encryption, the industry's leading standard, and a zero-knowledge system to protect your passwords and personal data. 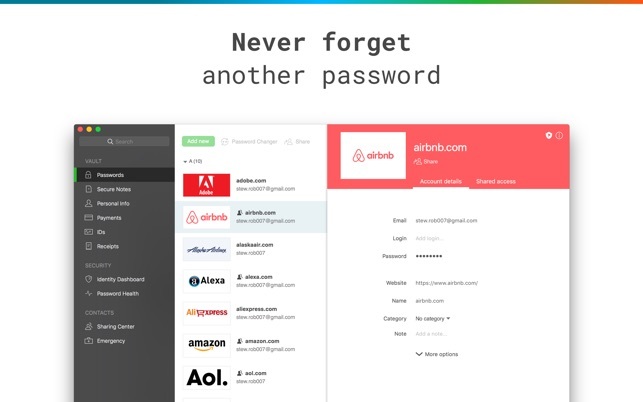 -Your master password is your private key to unlocking Dashlane.No one knows it but you—not even Dashlane—and it's not stored anywhere on your device or our servers. -Dashlane requires you to log in from an approved device. Built-in two-factor authentication ensures you are you, every time you unlock Dashlane with your master password or Touch ID. Visit our Help Center at support.dashlane.com. 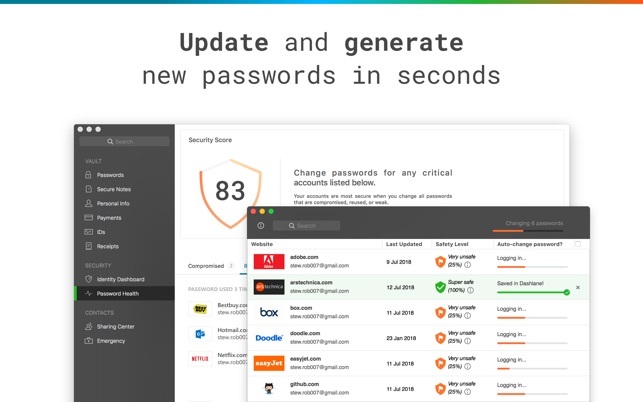 Dashlane 6 introduces a suite of new tools and features to help you manage your digital identity—not just your passwords, but all your personal information that lives online. - NEW! 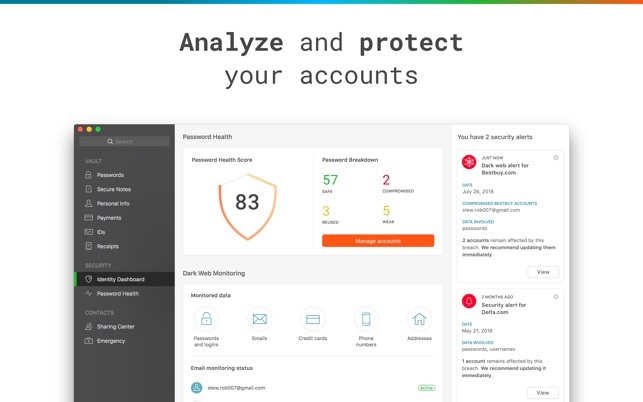 Monitor your Password Health in our new Identity Dashboard. Get a complete picture of your online security in one convenient place, so you can understand what to improve and take action fast. - NEW! Dark Web Monitoring: Dashlane scans the web for any leaked personal data and sends alerts, so you can take immediate action to protect your accounts. - NEW! 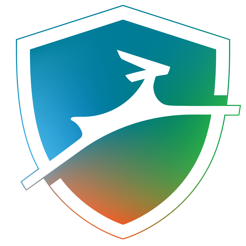 VPN for WiFi protection: Dashlane encrypts your online activity on unsecure WiFi networks to always keep your personal information safe and private. In this update, we're also introducing a new plan, Dashlane Premium Plus (U.S. only), to help you prevent and protect yourself from the consequences of breaches and identity theft. Premium Plus includes all the benefits of Dashlane Premium, plus credit monitoring, identity restoration, and up to $1 million of Identity Theft Insurance. I don’t understand the good reviews! It doesn’t work well! I used LastPass for about the last four years. I am not advertising for LastPass as I was somewhat frustrated with it. However, it is a comparison to this poor product. DashLane was advertising better integration across devices and sites so I read the reviews and took a 3-year leap at $99. I have been so disappointed! I was just over the 30 day refund policy and they would not even discuss a partial refund but said they would work through the problems. I kept giving them lists of problems and they kept asking me the same questions over and over and telling me to try the same uninstall/reinstalls. I can honstly say I spent more time than they did trying to fix it. Some of my list was: Logging out of websites, especially Google. Logging out of DL even though logout is set to NEVER. Did not recognize Marriott web site at all even though is was in DL. Does not recognize form fields for my bank site. Constantly tries to enter personal information in form fields that are not for personal info. Does not recognize Alaska airlines site. Sixt Rental Car login brings up credit cards rather than logins. Touch ID doesn’t work on MacBook Pro. So on and so on…. I’m throwing my money away and returning to LastPass. I wish both were better, but I only had one-tenth of the issues with LastPass that I had with DashLane. A medicre product that they clearly don’t stand behind or care about after the sale. I’ve been using this for two or three years. Sometimes it works, sometimes it doesn’t. I’m constantly bringing up the program and asking to see the password for a site so I can put it in for myself. It just doesn’t seem to recognize some sites when you go there to log in. Now I agreed to an update (from the App Store) a couple of days ago, and every since, I cannot get into Dashlane at all! I went to their website and explained the problem. I received an email back from “William” telling me to de-install it and reinstall from their website. I removed it, but when I went to reinstall it, it automatically took me to the App Store. So the program still doesn’t work, and in the meantime, I’m trying to work!!! Since “William” had asked me to let him know if I was successful, I issued another plea for help. This time I received an email from “Isagani” and he offered me two options, one of which was only good if I’d originally downloaded from their website. The second, going to the App Store, was the kicker. Here’s the advice: “On MacOD, and if Dashlane was downloaded via the Mac App Store, please note that we have submitted our fix to Apple for validation, which should take about 48 hours. If you need to get into Dashlane urgently, we can guide you in removing your version downloaded via the Mac App Store, and install the one from our website. Please let us know should you wish to proceed this way.” Unbelievable! Almost never worked on iPhone.. Now they want more money? I loved Dashlane when I first started using it about 3 years ago. It worked great across all platforms, my MacBook Air, iPhone 5s, 6S and 8, and my iPad. It seems like the past year or so it hasn’t worked hardly at all on my iPhone. I don’t really use my iPad anymore though so I can’t say anything about that. It still -usually- works on my MacBook. Usually. Not enough though. I had a hard time paying $40 a year for the Premium. Whatever, I get everything across my devices. But since that hasn’t been working correctly, I got annoyed. The straw that broke the camels back was when I updated to the new “better” Dashlane 6. From here on out it’ll be $60/year instead. Im done. Its not worth it. I unregestered a month early. It always updates information perfectly across all devices, it just doesn’t integrate with Safari on iPhone hardly at all anymore. 9/10 times it will crash and I have to go open the app, use touch ID, copy login, switch to Safari, paste login, switch to Dashlane, use touch ID, copy password, switch to Safari, paste password. Extremely unnecessary and annoying. So I just spent about 3 hours moving all of my information correctly out of Dashlane and I'll never go back to it. You keep your software, I'll keep my $60/year. I hope this review helps guide people before they unknowingly drop $60 on somthing that doesn’t work properly.